I decided to link up with both Rachel Anne and Linda today. 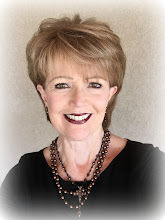 I'm not participating in Linda's flashback, but still wanted to "connect" with my "blogging buddies" at that meme, so hopefully Linda will forgive me for just "doing my own thing" today. ~smile~ I just love these two gals! and my newest "blogging buddy," Cindy at Notes in The Key of Life. (isn't that the cutest title?) These gals are just lots of fun to read and I always look forward to stopping by their blogs. You can check out my left side bar for other blogs that I really enjoy and I add to that list almost every week. I have such fun visiting around! 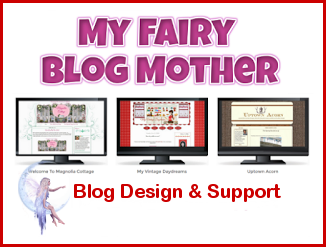 When I started blogging I thought it would one day be a treasure for my children. While it is not exactly a journal, it is ME. 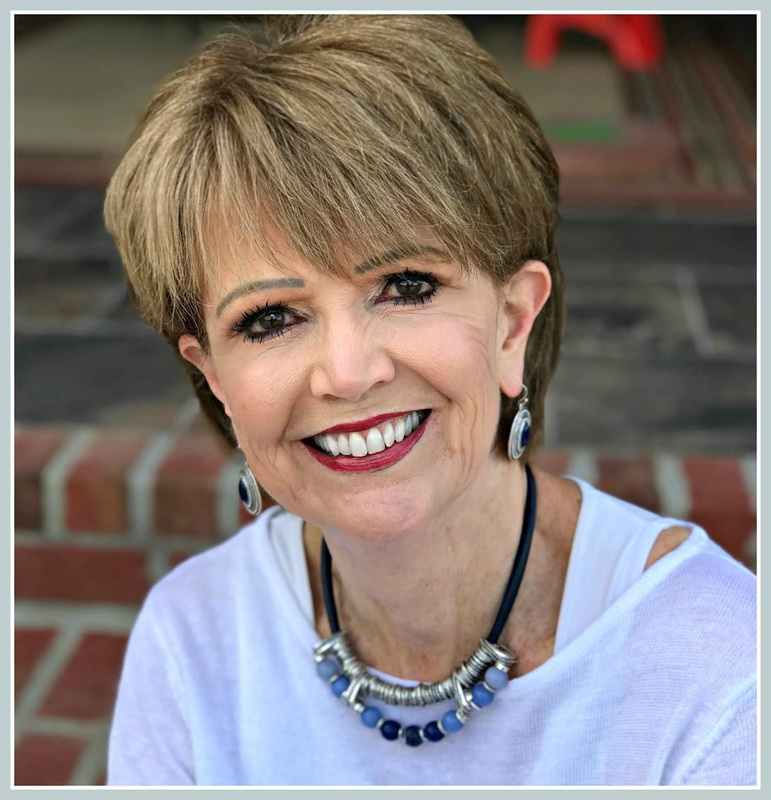 I have so enjoyed reading some of my Mom's writings since her death in 2008 and hopefully this blog will serve much the same purpose with my children. I am having them printed at the end of each year in book form through Blog2Print. I saw this poster at the Yellow Daisy Festival the other week and really wanted to buy it. I couldn't think of an appropriate place to hang it in my house, so I just decided to take a picture of it. 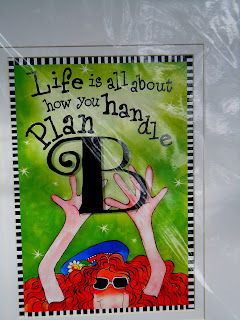 I think there is so much truth to what it says and I have a hard time when I have to resort to Plan B. I rock along pretty well as long as Plan A goes as planned. Ugh! Life sometimes gets in the way of Plan A and truly "life is about how we handle Plan B." Plan B for the Christian means trusting Him to see you through when the way may not look all that smooth and is definitely not what you had planned. 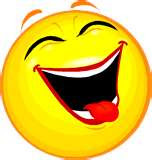 Speaking of life..........I was reading Beth Moore's blog a while back and she mentioned that she had been under a lot of stress in the past months. Anyone with her schedule would definitely be under stress, but I don't know if that was what she was talking about or not. But, I think it does us good to occasionally be reminded that NO ONE lives a stress free life. Not Beth, not Anne Graham Lotz, not Kay Arthur, not Prisilla Shirer, not your Bible Study teacher, not your best friend, no matter our plot in life, there is stress. I use to be guilty of looking at some folks and wondering how they seem to never have any worries or cares. As I have gotten older, I now know that just because someone has a smile on their face and doesn't talk about the obstacles they are facing, doesn't mean they have none. It just means that they are plugging along one day at a time and are remembering the ONE who brings their JOY didn't promise they would always be happy. As long as we have the breath of life in us there will be stresses in the form of death, health related issues, disappointments, finances and various other struggles and heart ache. What a joy to know the Savior of all stresses! I wish for each of you a refreshing and relaxing week-end. I've got my smile on my face and joy in my heart, how about you? Dearest CiCi - do not discount your wonderful blog! Your love for the Lord, your family and friends shines through every word - "just you" is a mighty special thing! Some people can distill their thoughts and write deep, thought-provoking posts - and others simply write from their heart and show the same thing by example. There are a number of wonderful Christian blogging friends out there I may never see face to face in this life, but greatly look forward to seeing in the next! Mrs. Lea...you are a blessing and I LOVE reading your blog. You are an inspiration and definitely not shallow. Your children will love the treasure that you are leaving them! Love the sign...I need to remember that. You are right, no one leads a stress free life, we live in a fallen world and we don't get stress free until we are with our savior in Heaven...but how lucky we are to have Him walk through the valley with us! Hi Cici-I am glad we have become blogging friends! I look forward to reading your blog and I hope you have a great weekend! Hi, Lea! I'm a bit sad today because I just had to say good-bye to my mom and sisters, but I'm so thankful for the wonderful time we had together. It was a gift! I love your blog! You do write from the heart and that is worth reading for sure! You make blogging sound soooo wonderful and I'm often tempted to jump in. Just can't justify the time involved at this time in my life. But I sure love visiting you and many others as I'm able. I think I live in plan B mode most of the time. Fortunately God gave me for the most part a "role with it" personality. So glad we were able to link up on fb! I look forward to chatting with there sometimes too! Hi, CiCi -- I clicked on your FFB Mr. Linky link and got to read your nice write-up about blogging friends. Keeping blogging friends is a two way street, isn't it? One can never have too many friends but it is hard to cultivate so many friendships. I tell non-bloggers that having a blog is like having eighty or a hundred pen pals. They understand that. I hope you'll write Flashback next week. Even for us who aren't OLD it is still fun remembering ours and then reading the others'. I look forward to reading your posts... and I am always blessed and encouraged by what you write! It is so strue, that no matter where we find ourselves...He is our Joy and strength! Shallow, no, that is not what I would call you. Seriously, your blog is a warm haven and I absolutely couldn't imagine not being able to visit you here. You are wonderfully, amazingly YOU and that is why we all come back! Oh, and thank you so much for your link to my blog in your post. Sweet, dear you! Hey Lea! You're featured on my blog today too! How about that! Thanks for your kind words. The problem with writing a book is that I can only write when I'm inspired. The inspiration comes in spurts and I fear it would take me years to get a book complete. Maybe I could write a devotional book though. Hmmm something to think about. I think you are just about the most precious person I have ever come across! I am so thankful our paths have crossed. What I love most about reading 'Cici's Corner' is that you're real - your genuine nature shines through! What a gift your books will be for your family in the years to come. I love that idea! I never thought to do this and to do it on some sort of schedule. I'm definitely going to look into it. Isn't there some great community in the blogosphere?! Thanks for the link to the Blog2Print site. I've only heard of Blurb, but not sure that they make books from wordpress anymore. Let me know how the book turns out. Lea, I absolutely love visiting your blog. You are not shallow. I always leave feeling inspired with a smile on my face. I love that you are "real"! Thank you for the shout out! I am off to visit some of the others you mentioned who I haven't met yet! Have a fabulous weekend! Isn't it interesting the community that blogging creates? I've been so blessed by the friendships and encouragement that I've found here. Including yours. Thank you for taking time to comment on my blog. I really do appreciate your words. I wouldn't call you 'shallow' by any means! Friendships aren't always "deep" and depth does get tiring on the brain sometimes. Visiting your blog is like walking into a cheerful kitchen. It is wonderful that you are printing your blog to have something for your children to hold in their hands.